This is a bit of fun. The amount of temporary destruction and noise generated by these three young felines is astonishing but I aM sure that it is not exceptional. It is a nice vignette of exuberant kitten life at home. I remember my sibling kittens when living in London tearing up a nice leather sofa not by using it as a scratching post but by running over it, one chasing the other, leaving claw marks. I think it improved the appearance of the sofa – an instant used look. Ten years wear and tear in ten minutes. This entry was posted in play and tagged cat play, cat playing by Michael Broad. Bookmark the permalink. The comment written under the video is also a big clue. Running up walls is a classic panic response. There is little interaction between those cats, other than collision. Again, that is not play. Next time you deal with a terrified feral cat or a severely panicked stray, give the video another look. I agree there is a element of anxiety in their but not sure it is terror. How is this a ‘bit of fun’? This is not feline play. These young cats are terrified. This is how cats behave when they are panicked and terrified. Letting them loose in a cluttered bathroom, with a bright light on, then filming it, shows someone isn’t focussed on the needs of those poor cats. Why label this as fun? Jane, I am not sure, with the greatest of respect, that you are right that these cats are terrified. I agree that they might be in which case I apologise for the opening sentence. But this is a bathroom, a small bathroom. If they were panicked then I would have thought that they would have run out of the bathroom but you can see one or two of them pausing and then carrying on. To me, it looks more like play which got out of hand because of the noise and chaos generated. This noise and disruption may have made the cats anxious which exacerbated the general mayhem. 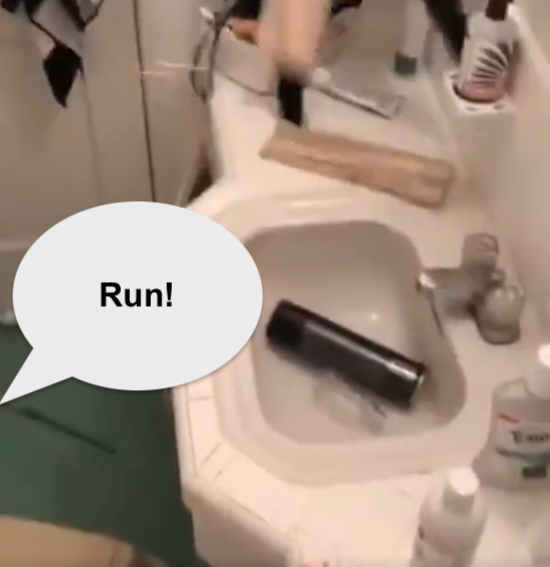 Also remember that the cats’ owner (I will presume that) is videoing her cats running around a small bathroom. She may have generated it by raising her voice towards them but I’m not sure they are terrified. Also, they are young cats and young cats, as you know, tend to run around somewhat manically for the fun of it often chasing each other. They are burning off excess energy. Oops! I replied to you at the ‘top’ with a new comment, not a reply down here.